I’d be lying if I told you I was good at computers. As a matter of fact, most of the things I do on my blog somehow just manage to come together and miraculously work. Almost all the time…almost. I will begin by telling you of the day that ‘it all started’. Last week, I was merrily making enhancements to my blog (like I always do), when I noticed…what? I can’t add an html code that’ll let me change a hover color of a button? The more I dove into it I realized the worst. Even after buying a domain name (www.livinginanotherlanguage.com) I still DO NOT have total access to my wordpress.com site. Then I tried adding a sponsor page with passionfruit ads so I could keep my sponsors in order (hey…do you want to sponsor swap btw?) and found out that wordpress.com does not allow ads besides their own on the site. Plus…once again the HTML wasn’t working. The last straw was when Melissa from over at Life of a Not So Ordinary Wife sent me the html code for the blog hop I was co-hosting. Yet again the html didn’t work. That was it, I had it and began researching my options. The most popular switch seemed to be from wordpress.com to wordpress.org. Little did I know it was going to take me several long, stressful, ridiculous hours to make the ‘easy 5-step installation’ successful. Even this morning (as I’m sure a lot of you found out) my website was basically just gone…floating in cyberspace somewhere. Between getting up at 6am (after staying up till 2am trying to figure it out), going to work for 2 hours, and talking to 3 website techs…I’ve pretty much had enough website drama for the next year. Looking back on it and asking myself, “Is it worth it?” I’m hoping yes. The answer needs to be yes. Ok…so what’s the big difference and why was it such a headache? 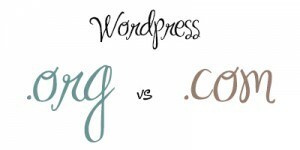 WordPress.com is a free company that helps you create the blog of your dreams-for free! It’s SUPER user friendly, and you can find answers to your questions anywhere. If you’d like to get a little bit more advanced in your blogging, they even offer the next step with their super spiffy Custom Design program. I used this program for almost a year and LOVED it. It was a great investment for me, and helped me mold my blog into the way I wanted it to be. And then my growing knowledge of HTML happened. WordPress.org is a software built by the same people who created wordpress.com, but it’s a little more advanced. It’s an open source software that you actually download into your host site (yeah, I had to find one of those too…and I didn’t even know what the heck a ‘host site’ actually did for me), and edit your webpage from there. My HUGE problems started when I realized I had just bought my ‘new’ domain name: www.livinginanotherlanguage.com less than 60 days ago. That meant I couldn’t simply just ‘transfer’ my blog, I had to go into some strange, foreign, back file of my blog domain and switch something called a ‘name server.’ Way over your head? Well it was mine too…but looking back on it, that was the easy part. The next 6-10 hours go by in a blur of redirecting, deleting, editing code (wow I sound so tech-y!) rewriting, styling, and renaming. Oh yes…and reattaching 1,710 images back to my blog. Please though, if you see anything on here that looks a little weird (aka: out of place, strange, not working right), please let me know right away.